I’m afraid that the Church in general has not always been completely honest with the people that we have tried to bring in. I don’t think we have been purposely dishonest, but we have perhaps given a message that is not completely accurate. What kind of message do we give seekers and others interested in Christianity? Come and join us because church is fun and Christians are friendly and Jesus is great and life is awesome. It is true that my life is much better now as a Christian than it was before. My life is not easier, but it is better. Hopefully our Christian life will be joy-filled and happy. But there are no such promises that life is going to go well. What if a seeker came to us and asked what Jesus had to say about the Christian life? Would we tell them that Jesus compared discipleship to anticipating capital punishment? That is what he is doing when he calls us to take up our cross. It is not about displaying a beautiful ornamental religious symbol. It is about being that person who carries the means of their own death to the place of their execution. Not a very cheery message. The reason is that Jesus was not so interested in making church-goers as he was in making disciples. It is the discipleship where we see the cost. There are two things happening today that I think will help us to understand what a cross bearing disciple looks like. Tomorrow is Remembrance Day and people all over the country will be gathering at cenotaphs to remember those who served, those who sacrificed and those who died. Having said that, there are mixed feelings within the Christian community when it comes to veterans and those currently serving in the Canadian Forces. Some Christians see such service as patriotic and honorable, something to be respected. 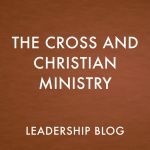 Other Christians disagree and argue that it is impossible for a Christian to serve in the military, that any such service is completely against the Jesus way. I am not going to tackle that one. What I will say is that there is something we can learn from those who serve, no matter what we think about war. Notice that Jesus tells us to pick up our cross. He does not say those who are in favour of capital punishment pick up your cross, otherwise find your own metaphor. Something can be true even if it makes us uncomfortable. Besides, there is a reason that Remembrance Day is on the anniversary of the armistice, the point is peace and not the glory of war. War brings the best and the worst out of people. We have heard the horror stories. We don’t hear about the man at my last church who lied about his age to get out of the orphanage that he had lived in all his life to join the army. He landed at Juno Beach on D-Day. Being dropped off far from shore and being burdened with equipment, he went right to the bottom when he was pushed out. He had the presence of mind to jump back up, take a gulp of air and hop his way to the shore, all the while bullets were shooting by him. Being a padre, I am fond of padre stories. On the night of 6/7 June, after the D-Day landing Padre Walter Brown and two other soldiers were moving up from the beach to a field hospital when they were captured by soldiers from the 12th SS Hitler Youth division. One soldier was killed, another was wounded and escaped. The wounded man described seeing Padre Brown, a non-combatant, approaching the SS soldiers with his hands raised. Brown’s bayonetted body was recovered weeks later. A padre, who could have stayed in safety, gave his life for what he believed in, which was helping soldiers, especially those who were wounded. Then there is the most famous Canadian padre, John Foote. Foote was at Dieppe, which had been held up as the great chance for a European foothold but quickly became a disaster. Foote worked hard in extreme danger to get soldiers to the boats during the retreat. When he was forced to go on a boat, he jumped off so his place could be taken by another. He felt that his place was to be among the men that were captured. For his courage, he received the Victoria Cross, the only padre to do so. I have not done anything brave, but I have gotten to know many soldiers who have served in Afghanistan. I have listened to their stories of fighting, not another standing army with identifiable uniforms, but people who looked just like the people they were trying to protect. I have heard stories of befriending old men who would come every day for months and then one day would detonate themselves in an attempt to kill as many people as possible. There is tremendous bravery among these young men and women. Why bring this up? What is a soldier? A real soldier? One who has a mission and who puts aside their own needs and comfort to accomplish that mission. As disciples of Jesus, we have a mission: the great commission, which is to go and make other disciples. This is not an option for those who feel led. It is the mission, a dangerous mission, an uncomfortable mission. But it is the mission. In addition to tomorrow being Remembrance Day, today is the International Day of Prayer for the persecuted church. I find it interesting that Canadian Christians feel persecuted. We complain because non-Christians don’t pray the Lord’s Prayer in school anymore. We complain because people get offended when we wear a Christian t-shirt or a Christian bumper sticker. We complain because the church does not have the same social clout that we did in the 1950s. Let me make it clear that we have no idea what persecution is about. Did you know that around the world, 200 million Christians suffer for their faith in Jesus Christ. There are more Christians being persecuted today than at any other time in history. At this very moment, a religious genocide of Christians in Syria is taking place; in China authorities are pressing in and raiding unregistered House Churches; in Pakistan Christians are being arrested for allegedly sending “blasphemous” texts – while the Western media is silent. Believers all around the world face violence, imprisonment and even death because of their faith in Christ. In Muslim countries, converts to Christianity risk their very lives for faith in Jesus. I have a friend in England who converted from Islam to Christianity, and even there she must be careful about who she tells her story to. Real persecution is going on. Think about the quality of faith that these disciples of Jesus have. They understand what it means to take up their cross and count the cost. A cross is not a piece of jewelry but a reminder that they are following Jesus in his suffering. What would we do if we were in such a position? What if church was not fun but was a place such as Egypt or Nigeria where we were in mortal danger? What if our families not just thought we were weird but reported us to the authorities? There would be no pew sitters. There would only be disciples who were all in, people who knew who they were serving and were willing to give anything for it. People who knew the mission and were willing to lay down their lives for it. Jesus is not just looking for believers, he is looking for disciples. The image that Jesus gave for disciples is that of one who takes up their cross. That is one who will lay down everything for the mission at hand. We see this same courage in soldiers who have put their life on the line for their mission. Many died, many were wounded, many brought invisible wounds home. There is a courage among men and women of the military that goes beyond our debates over the nature war. That same courage is found among persecuted Christians around the world. The question we have to ask is what about us? We can observe the bravery of soldiers and martyrs and make note of it. But what does it mean to us? What can we take away? How can we be inspired? I hope that we can take this time to re-evaluate what it means to be a disciple of Jesus. What is the cross that we need to pick up? What is the cost that we need to pay? Let us reflect on who we are and what means for us to serve Christ.